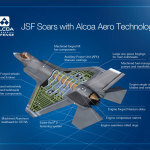 "Through our expansion in titanium, Alcoa is sharpening its leadership edge on state-of-the-art aircraft, including the most advanced fighter jet in the world—the F-35"
NEW YORK--(BUSINESS WIRE)--Lightweight metals leader Alcoa (NYSE: AA) today announced a contract to supply titanium for Lockheed Martin’s (NYSE: LMT) F-35 Lightning II aircraft program, also known as the Joint Strike Fighter (JSF). 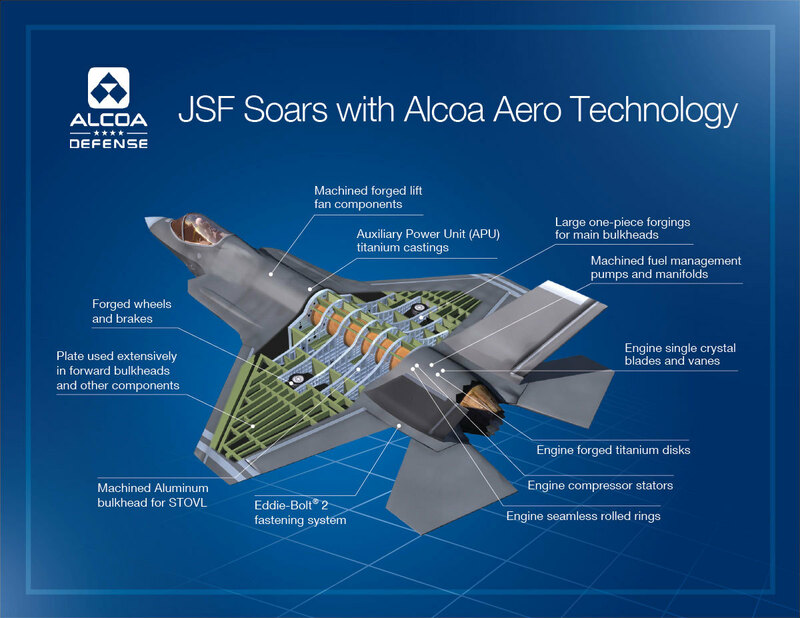 Under the contract, Alcoa becomes the titanium supplier for airframe structures for all three variants of the F-35 over nine years, from 2016 to 2024. At current projected build rates, the contract has an estimated value of approximately $1.1 billion. Alcoa will supply titanium plate and billet from several operations gained through the RTI International Metals acquisition. The titanium will be used to manufacture airframe structures for all three F-35 JSF variants: The F-35A Conventional Takeoff and Landing (CTOL) aircraft, the F-35B Short Takeoff/Vertical Landing (STOVL) aircraft and the F-35C Carrier Variant (CV). Under a different existing contract, Alcoa will use the metal to forge all of the largest titanium bulkheads—the “backbone” of the aircraft structure—for the CTOL variant at its Cleveland, Ohio operations. Approximately 75 percent of all F-35s produced are CTOLs. “This contract with Alcoa is a key element in securing our supply chain with a strong U.S. partner for a critical, strategic raw material," said Dan Pleshko, vice president of Lockheed Martin Aeronautics’ Enterprise Supply Chain Management. Several high-performance components for the F-135 engine, including seamless rolled rings that encase the engine parts, titanium forged disks, and advanced single-crystal, nickel superalloy blades and vanes that enable the engine to operate at temperatures hotter than the melting point of the superalloys, increasing fuel efficiency. The F-35 Lightning II is an advanced fighter aircraft combining stealth, speed and agility, designed for many kinds of missions. Lockheed Martin’s full-rate production goal is 13 aircraft a month by the mid-2020s, up from an average of three aircraft delivered per month in 2014. Alcoa has been growing its multi-material aerospace business to capture growth in the global aerospace market in support of its broader transformation. Alcoa recently acquired global titanium leader RTI International Metals, aerospace components manufacturer TITAL and global jet engine parts leader Firth Rixson. 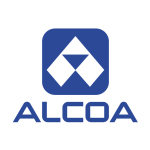 Alcoa also has grown organically. It opened the world’s largest aluminum-lithium facility in Lafayette, Indiana, launched expansions to increase jet engine parts production in La Porte, Indiana and Hampton, Virginia, began installation of advanced aerospace plate manufacturing capabilities in Davenport, Iowa, announced plans to double its coatings capabilities for jet engine components in Whitehall, Michigan and announced an investment in technology that strengthens the metallic structures of traditional and additive manufactured parts, also in Whitehall, Michigan. 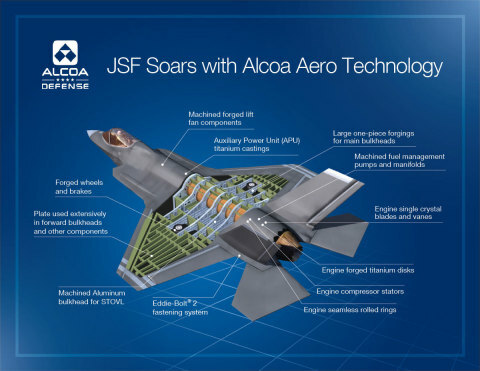 In addition to the F-35, Alcoa has been a partner and supplier to the military for decades, enabling high-performance defense vehicles across air, land and sea. 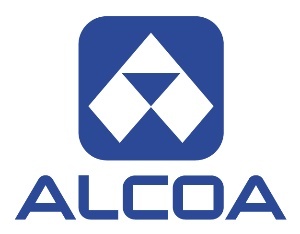 For more information on Alcoa Defense please visit www.alcoa.com/defense.